Scalawag is starting a new initiative dedicated to in-depth reporting on how folks across the South are combating white supremacy. Join us—and share your stories. In order to heal, we have to diagnose what ails us. Many sum up the national problem as “America is struggling with race.” But we believe that the U.S. is in fact struggling with racism, specifically white supremacy and anti-Blackness. Overt examples of the violent and painful outcomes of white supremacy abound, from the murder of Trayvon Martin in 2012, to the massacre at Mother Emmanuel in Charleston in 2015, to the election of a president openly supported by the Ku Klux Klan, to the recent refugee ban, and violent mobilization of white supremacists in Charlottesville. The history of white supremacy is deeply connected to the American South—from slavery to secession, the founding of the White Knights to the development of “states rights” strategies to defang integration and anti-discrimination laws, from Jim Crow to mass incarceration. And yet, the history of American Blackness is also a Southern story—not merely as a racialized category, but as a cultural, political, and economic identity. In fact, the South is home to some of the fiercest and most successful opponents of structural racism. This fact is so often overlooked that Martin Luther King, Jr. isn’t even widely talked about as a Southern leader—let alone John Lewis, Diane Nash, Ella Baker, and others. Scalawag is committed to telling the long story of Southerners combating white supremacy. 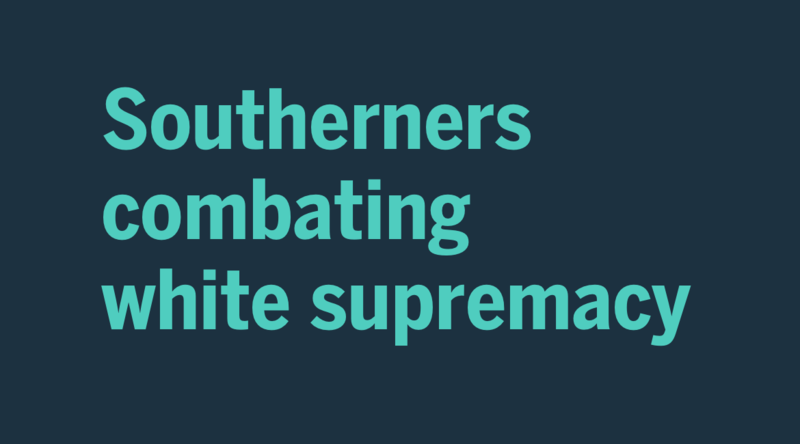 We aim to move our conversation from flags and statues to the strategies and solutions Southerners are pioneering every day in our region to create a more just and equal South. Scalawag recognizes that communities of color have been talking about the issue of white supremacy for centuries, but the need for all of us to listen and respond is pressing. For us to realize our mission of reimagining the South and making our region a more equitable and empowered place for all Southerners, we believe in taking a hard look at the gaps in regional coverage, contextualization, and analysis of what racism is and how it functions. Symbols are important, but we want to investigate how systems of white supremacy and anti-Blackness disempower Black and brown communities, poor white folks, and our nation as a whole. If you are interested in hearing more about our goals for this initiative and our commitment to combating white supremacy, we’ve written an editorial that provides some more information. In it we put forward the way Scalawag conceptualizes white supremacy and anti-Blackness. We also discuss the importance of the media in shaping racialized narratives and the opportunity and obligation current outlets have to dismantle them. On top of even more regular reporting examining structural racism and white supremacy, for the next few months, every other week Scalawag will bring you stories that highlight everyday Southerners fighting for a more just South. We'll share profiles of folks confronting white supremacy and anti-Blackness in their communities with creative strategies, dedicated coalition-building, and unwavering commitment. We will also be reporting on how white supremacy is institutionalized in our region, from housing to healthcare, education, religion, and the criminal legal system. As a part of this initiative, we are working to partner with local and regional media outlets, and are particularly interested in joining with those owned and operated by Black and brown folks. We know we have a lot to learn from their expertise and work in this arena. But most importantly, we want to make space for you to join the conversation. Post your thoughts in our Scalawag Readers Facebook group, tweet at us, or tag us on Instagram; let us know who the folks are that need to be spotlighted in doing this much needed work. If you are a writer or reporter, we encourage you to submit pitches related to this topic. We can’t do this work alone. Tell us: how do you define white supremacy and anti-Blackness? Who do you know who is working to end it, whose story may be unsung? If you are feeling hopeless or exacerbated by tepid, surface-level analysis of these very pressing issues, know that we see you. Scalawag is committed to bringing you the fuller story behind the symbols, rallies, and counter protests—the South’s grim waltz with white supremacy and anti-Blackness. We're here for the solutions. We're ready for a new kind of music. We're fighting for a better South. Folks in Washington, D.C. just don’t get it, y’all.